Why an intensive course of four weeks? Swami Vishnudevananda continued the traditional Indian system of Gurukula, in which the student lives with the teacher in an Ashram (Yoga and meditation center). Closely supervised by the professor, the student works physically and mentally and acquires the full experience of Yoga, which he can later transmit to others, as his teachers did for him. In the efforts to create the most favorable conditions possible, this training is structured as an intensive course in the Ashrams. 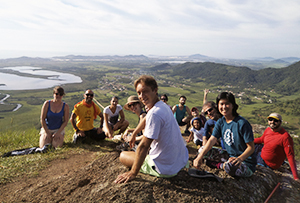 The course will be held in the Center "Montanha Encantada" (Enchanted Mountain) in Garopaba, a city located south of Florianopolis, Santa Catarina, Brazil. The Center offers halls and special platforms for the practice of Yoga. Accommodation comprises shared rooms of five persons in comfortable huts with bathrooms and showers. 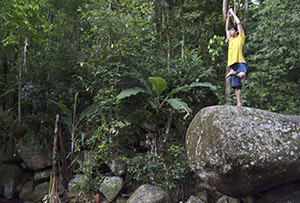 With views of the ocean and surrounded by mountains, in an area with more than 20 hectares in a rain forest tropical vegetation, it is the ideal environment for the practice and study of Yoga. Nutritious and delicious meals will be served, following the lacto-vegetarian diet pattern from all of Sivananda Ashrams around the world. At the end of the course and after passing the final exam, participants receive a Diploma of International Centres and Ashrams Sivananda Yoga Vedanta, which is headquartered in Val Morin, Canada. The title awarded is "Yogi Siromani" which means "Jewel in the crown of Yoga." This certificate is endorsed by the Yoga Alliance. " 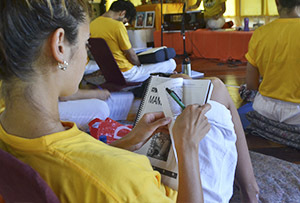 Participants share the meditations and the same environment with TTC students, but each activity is coordinated by teachers and held in specific locations. He was born in South India. He dedicated his entire life to the service of humanity. His teachings are a synthesis of all traditions and formal doctrines in Yoga. He is the author of more than 300 books on Yoga and Vedanta. Sivananda is the spiritual strength that inspires this training. One of the foremost disciples of Swami Sivananda, he was sent by his Master to the West in 1957. He is the author of The Book of Yoga, Meditation and Mantras, Karma and Reincarnation and a commentary on the Hatha Yoga Pradipika. Director of the Sivananda Centers in Montevideo and Buenos Aires, she has been organizing the TTCs in South America since the 70's. Also a direct disciple of Swami Vishnudevananda, she is known for her charisma and dedication. Swami Vishnudevananda’direct disciple. Teacher in Sivananda Yoga Vedanta Centers in Sud Amercia and international Sivananda courses in Argentina, Brazil and Spain. He is a big karma yogui who works in the promotion of Yoga and Vedanta since 1976. He was trained at the Sivananda Centres in Uruguay, Canada and Spain. He is a dedicate student of yoga and its philosophy. He has a deep inclination towards singing and devotional music. He currently manages the Sivananda Center in Buenos Aires. A Yoga teacher and staff at Sivananda Yoga Center in Buenos Aires, who helps in the teachings of the international teacher training courses in Argentina, Brasil, Colombia, Spain and India. A dedicated practicioner of Hatha Yoga and the studies of Anatomy according to the postures of Yoga. She also transmits with clarity her great knowledge in the fields of Yoga and Vedanta. In addition to the Senior instructors, we will have special guests and the participation of professors Sivananda of South America. Yoga practice and teachings require self discipline and purity. The following rules of the Ashram are based on that spirit: It is forbidden to consume meat, fish, eggs, garlic, coffee , black tea, onions, alcohol, tobacco and drugs. Attendance at all programs is mandatory. To obey the instructions of the professors. Adaptation to the communitarian life of the Ashram. It is not possible to meet special dietary needs. It is important to have a certain basic knowledge of the postures and the Vedanta philosophy, but beginners are also welcome. The course is intense and requires discipline, for that reason you must have sincerity in your desire to learn and to follow the rules. The Book of Yoga by Swami Vishnudevananda. The Bhagavad-Gita (with commentaries by Swami Sivananda). These are available at our english Sivananda Yoga Vedanta Centers or by internet. Please come with them. Other Things: Yoga mat, meditation cushion, lota for kriyas, your own bottle of water,toiletries, towels, notebook, pen, torch, warm and comfortable clothing, bathing suit, slippers, comfortable shoes for walking, raincoat, umbrella, sun block, insect repellent and alarm clock. This is an international course with instructors coming from several countries, In case of cancellation there will be no return, of the initial deposit of U$300. Each participant will receive two uniforms and course manual. The course will be taught in Spanish with simultaneous translation into English and Portuguese. Places limited. Register in advance. Send by mail the registration form with the rules of the course, complete both pages, attached your picture and send it signed with the deposit of U $ S 300 . The deposit is not refundable under any circumstances. We can guarantee a place in this TTC only after a deposit of US$ 300 is done. Your are responsable of all process to get your Visa and vaccines before shipment. International Sivananda Yoga Vedanta Centers (Canada) and branches in Montevideo and Southamerica Centers Montevideo.